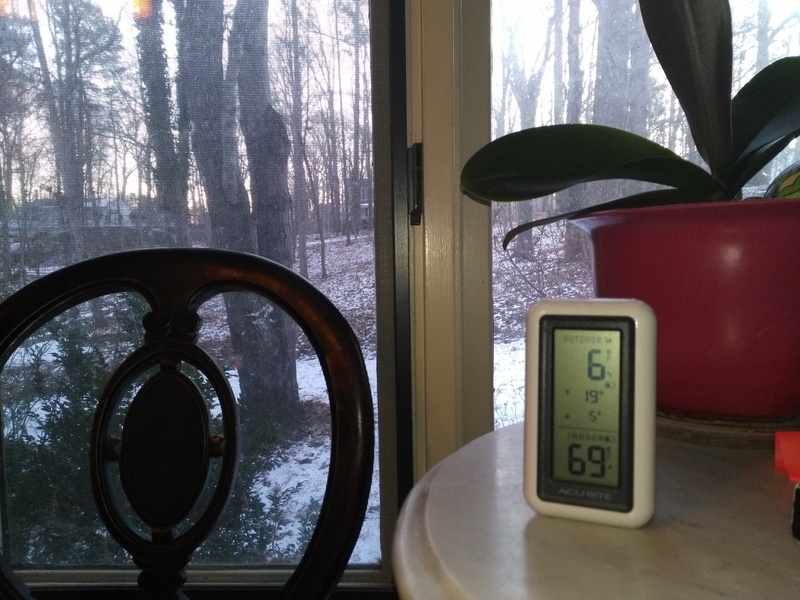 Auf DEUTSCH hier … Last week was crazy cold here … this morning RDU recorded 3 deg F and it was 6 Deg F at the house at 7 AM. Almost the entire week, temperatures stayed well below freezing, and the on the only slightly warmer day we got snow! Taking care of all the critters who have to stay outside was not trivial, when temperatures dropped into the low teens every morning. The horses ate an entire 800 pound bale of hay last week, and Patou ate a couple of pounds of meat and fat most days last week. We also had to get the horses warm water every few hours the first couple of days, but then Laura went on an epic quest to get a water trough heater – probably the last one in the county and that made things a lot easier. 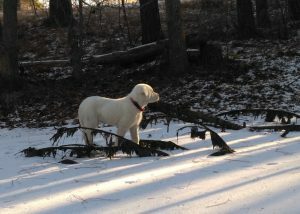 It was a bit scary to leave our 10-week-old puppy outside in these frigid temperatures, but she did fine. I insulated her dog house as best as I could with hay and cardboard. She seems pretty cozy in there, and I did get up every night at 2 AM to check on her and give her a bunch of chicken and some beef fat. Then we went to give the horses more hay and check on the emus and give the bunny warm water. Same thing for breakfast at 7 AM. She is really incredibly cold tolerant as long as she gets enough calories to keep that little furnace going. Die letzte Woche war es verdammt kalt hier … heute morgen um 7 Uhr war es minus 14 Grad C hier am Haus und am Flughafen war der offizielle Kälterekord minus 16 Grad C. Fast die ganze letzte Woche waren die Temperaturen auch tagsüber unter dem Gefrierpunkt. Nur einen Tag nicht, und dann schneite es auch noch! Es war nicht ganz einfach alle Tiere gesund und munter zu halten, wenn fast jeden Morgen das Thermometer auf unter minus 10 Grad fällt. Die Pferde frassen einen ganzen 400 Kilo Heuballen letzte Woche und Patou frass fast ein Kilo Fleisch und Rinderfett jeden Tag. Es was mir schon etwas mulmig, das 10-Wochen-alte Welpen draussen in der Kälte zu lassen, aber es hat ihr wirklich nichts ausgemacht. Aber ich habe ihre Hundehütte schön mit Heu und Pappkarton isoliert, und ich bin jeden Moren um 2 Uhr aufgestanden und gab ihr was zu fressen. Dann sind wir beide zu den Pferden raus und haben denen Heu gegeben, nach den Emus gaschaut und dann dem Hasen etwas warmes Wasser gegeben. Dann ist sie wieder zurück in ihre Hütte, und ich bin wieder ins Bett gegangen. Und um 7 Uhr gab es dann wieder Frühstück. Ihre Kältetoleranz ist wirklich enorm – ich habe nie irgenwelche Anzeichen gesehen dass sie ihr die Kälte zu schaffen machte. Sie brauchte nur all die Kalorien um ihren kleinen Ofen schön anzuheizen. 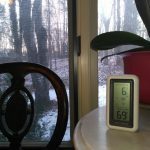 This entry was posted on Sunday, January 7th, 2018 at 8:43 pm	and is filed under Adventures, Just plain nuts, North Carolina, photographs. You can follow any responses to this entry through the RSS 2.0 feed. You can skip to the end and leave a response. Pinging is currently not allowed.